won't do your work for you. 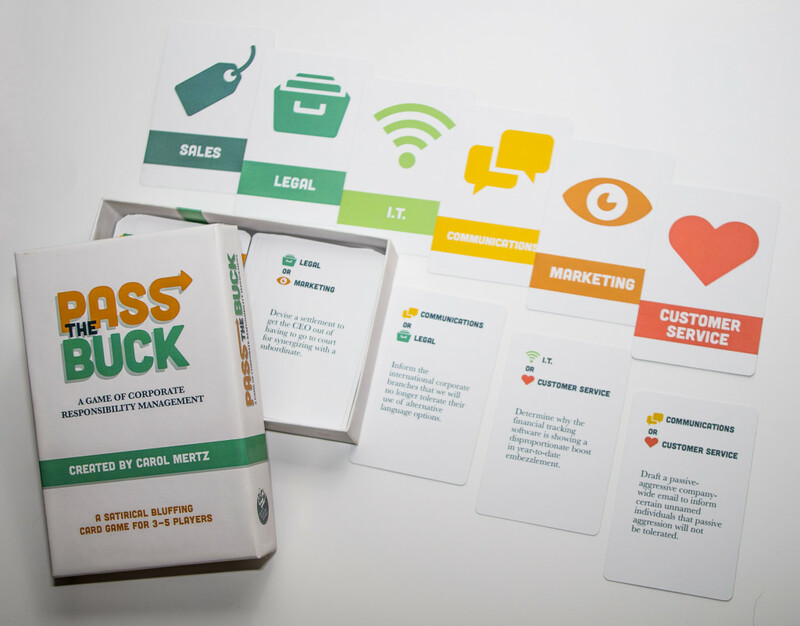 “Pass the Buck: A Game of Corporate Responsibility Management ” is a satirical card game for 3-­5 players, integrating both bluffing and hand management as core mechanics. In the game, players act as corporate employees who each have Tasks to do, Departments that determine their abilities, and a Level which indicates their job title. Players take turns as the Delegator, trying to eliminate all the Tasks in their hand by giving them to their opponents. To avoid them, players can bluff about whether they are in the proper Department to take a Task, but could be thwarted when opponents grow suspicious and call Human Resources. Pass the Buck was inspired by all the responsibility dodging that happens in big business. It’s funny, it’s challenging, and it’s just like real life but with more tongue-in-cheek humor and fewer real-world consequences. If you’re curious about my self-publishing process, you can read the publishing postmortem on my blog.